Massive columns defining a large porch, shuttered windows, vertical siding and stone work makes this country-inspired ranch a perfect addition to any neighborhood. Upon entering the foyer, you’ll be greeted by a spacious great room with large windows providing a view to the back yard. The kitchen has an breakfast bar that overlooks the dining room where you’ll love to relax with the morning paper. The master suite is tucked behind the kitchen for maximum privacy and features a tray-ceiling and a walk-in closet. 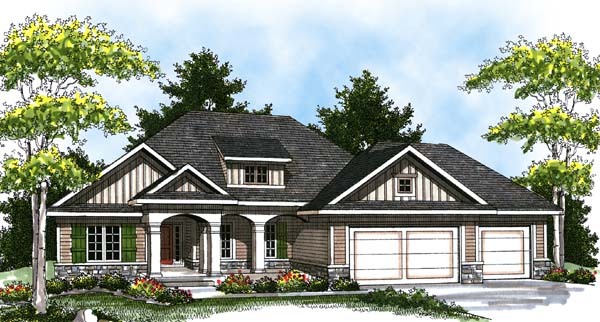 On the opposite side of the home, you’ll find two additional bedrooms and a full bath. The three-stall garage provides ample storage making this home appealing to many families.